Exams are just to assess your preparation. So just relax, it is not the end of the world if you do not fare well in them. First and most important is your preparation before exam is to make sure you have prepared well and know the important topics well. On the day of the exam, completely avoid last minute mugging and stressing. You should have a good sleep of minimum 8 hours the previous night. Organize. Make sure you have all the things necessary for the exam.Your stationary, your identity ticket and your watch etc…. Last minute searching for things can stress your mind further and create a panic during exam which can be disastrous. Diet. Before you go to the exam, eat foods that are energy producing and at the same time not too heavy on your stomach that make you sleepy in the examination hall. Never go empty stomach as you can end up concentrating more on your hunger than your exam paper. Fruits and proteins are good source of energy. Avoid intake of heavy carbohydrates like rice and potatoes which will make you sleepy. If possible carry a water bottle to the exam hall to rehydrate. Relax. One hour before exam, relax!! Don’t stress yourself feeding more information to your already worked up brain. Whatever you have learned be confident of it and try to picture a calm stream or take some deep breaths. You have done your preparation and now you should prepare yourself to give your best. A tired mind will do no good, so it is necessary to go in the hall with a refreshed mind. You have worked hard for it and nobody can take away your hard work. What you give always comes back to you. Remember this nature’s law. If you not prepared well, let your mind accept the fact. It is not possible to go unprepared and expect no stress and good results. Plan. Once you get the question paper in your hand. Read all the questions and make a quick rough plan how you are going to invest your time for doing your best. Mark the questions which you know the best and attempt them first. In this manner, you will increase your confidence further. Appreciate yourself for remembering the solutions and answers, your brain will work better. Never curse yourself if you forgot or didn’t study something which you thought about studying. Remember it is too late now, your focus should be on the present moment. Cross check. It is very important to check your answers again in the end. The last 15 minutes should be to review your paper. Recheck every answer with patience and you will be surprised to come across lot of careless faults. Make the necessary corrections. Forget. Most of the time after the exam is over we worry about the results or waste time discussing what our friends have written. 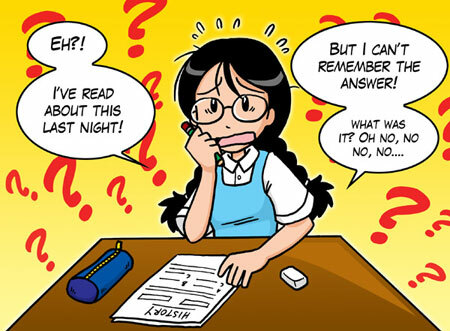 Realize that the time to do something about the results is passed when you handed the answer sheet to the examiner. Knowing how your friend wrote in the paper will only add more worry. Chances are that even the friend who told you he did not do well would have lied to you. Accept that everybody tries their best in the exams. Of course don’t count the losers. So in anyways you are losing your time and peace of mind trying to know what other did or spending energy on worrying which has already past. Concentrate on how you will face your next exam or how you are going to spend your time efficiently.